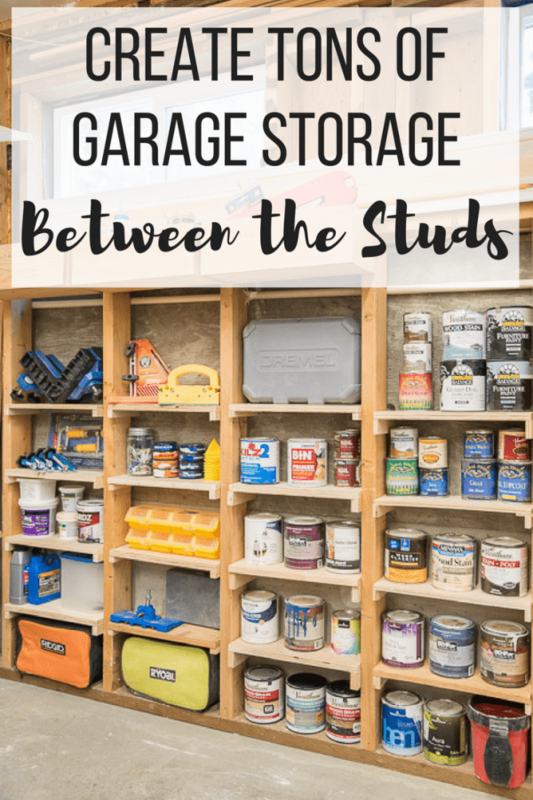 Turn those unfinished shed or garage walls into tons of storage! 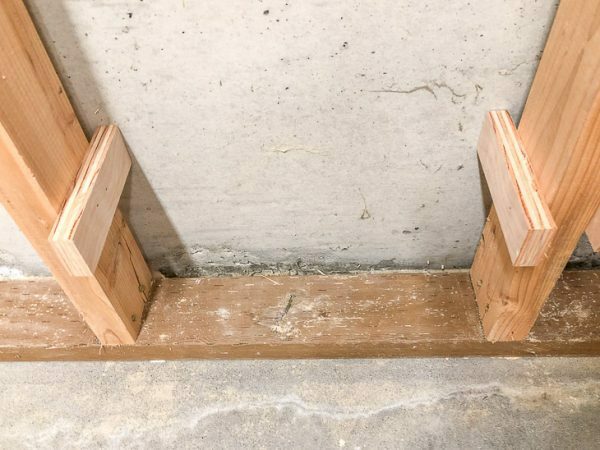 This super easy project can be completed in an hour or two, and creates between the studs shelves in an otherwise wasted space. It occurs to me that I haven’t done a Workshop Wednesday in ages! 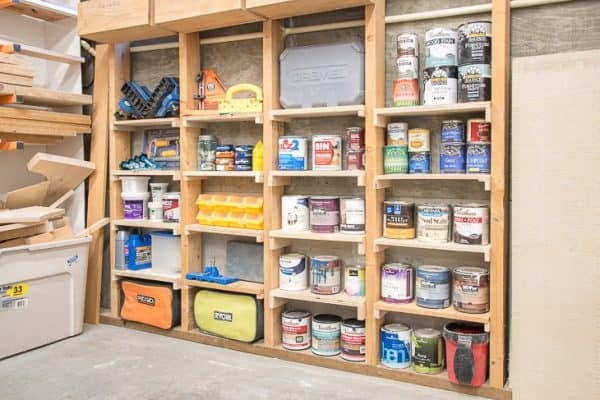 My workshop was a disaster after my bathroom remodel, and I was struggling to find places to put all the tools I had used. There’s one wall of exposed studs in the shop, and these between the studs shelves take advantage of every inch of space! 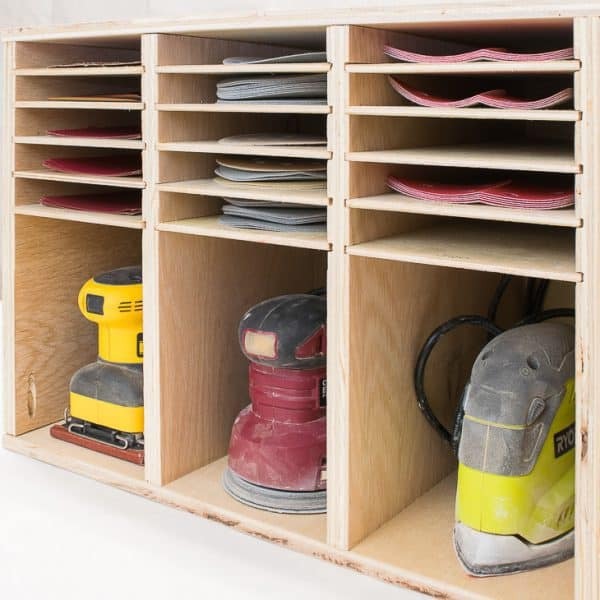 This simple workshop storage solution was inspired by my recessed bathroom shelves project. The shallow space doesn’t seem like much, but it makes a huge difference! I’m always trying out new workshop storage ideas to get my tools more organized. If there’s a designated home for something, it’s more likely to end up back there when I’m done using it! 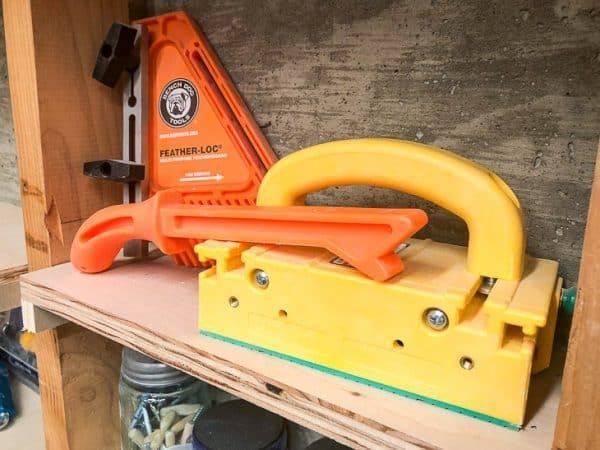 My sander and sandpaper storage rack is a prime example of this. I’ve never had to search for my sanders or sandpaper, because it’s always in the same spot! You can get the plans in my free woodworking plans library. 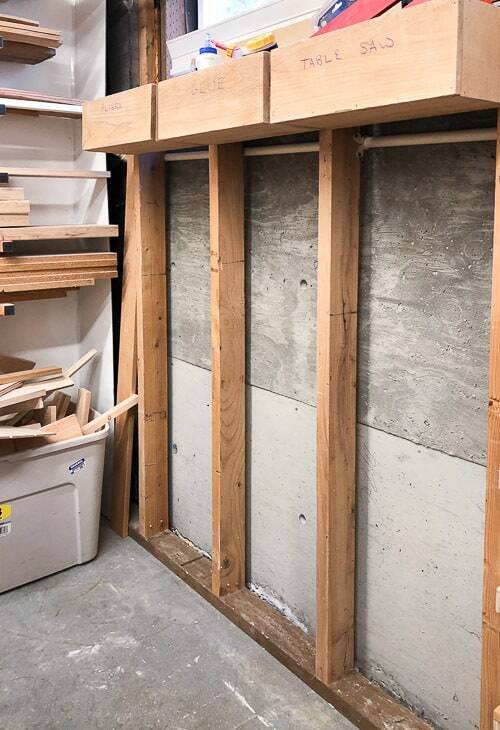 This wall with exposed studs is the last area of the workshop that hasn’t been utilized for storage. It was once the garage door, but the slope is too steep to get a car in here without scraping the bottom. The previous owner filled it in with concrete to make a parking pad outside instead. The studs fill half the wall with windows above. The cedar boxes at the top of the wall were for a project that didn’t quite work out as planned. But they work great for workshop storage now! A stack of plywood scraps covered up this wall for ages, but I cut them up for a project I’ll be showing you in a couple weeks. Time to create some between the studs shelves so the space doesn’t get hidden away again! I used a mix of plywood and 1 x 6 boards. You could also go the hammer and nails route, but the nail gun is faster and easier. 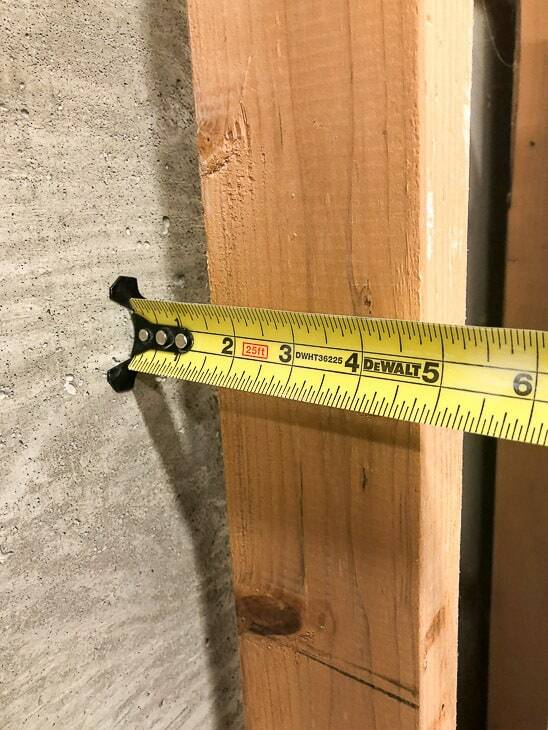 Before you start cutting, take a few measurements of your wall. While studs are supposed to be 16″ apart on center, they aren’t always exact. Measure the space between the studs and from back to front. I took advantage of the space between the studs and the concrete wall to make my shelves a little deeper. If protruding shelves won’t get in the way, you can add an extra inch or two to the depth of your shelves in the front. 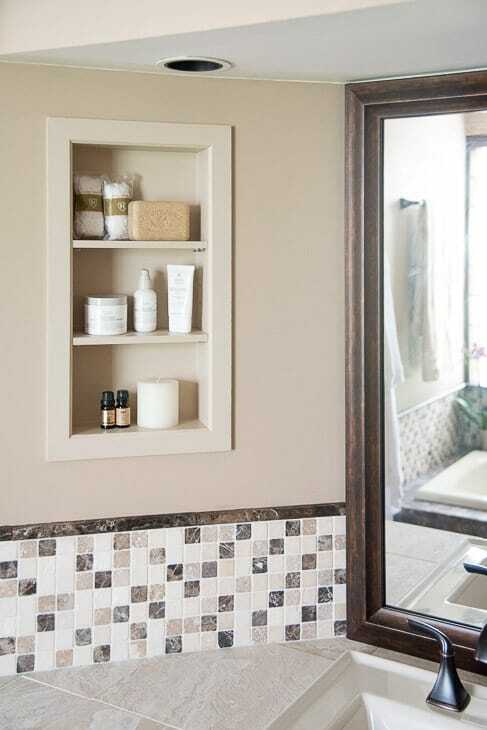 A 1 x 6 board provides plenty of space without sticking out too far from the wall. 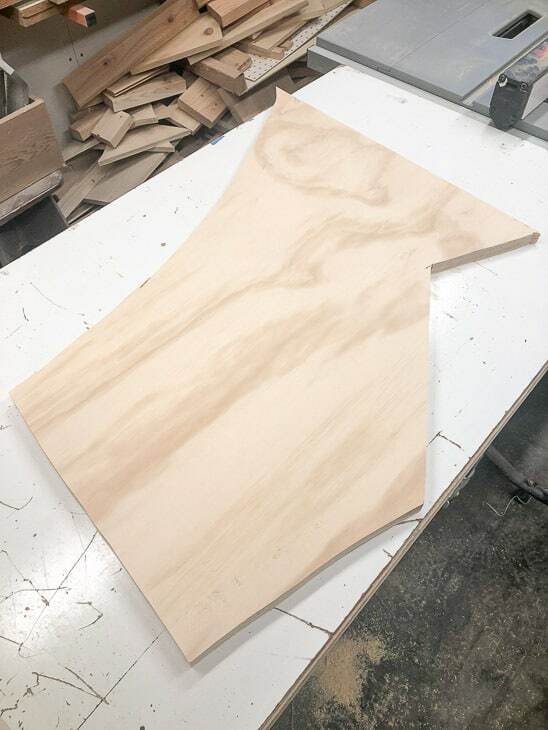 I dug around in my scrap pile for any board or piece of plywood that might work. There are a lot of oddly-shaped plywood pieces left over from projects like my rocket bookshelf, and I was happy to finally use them up! 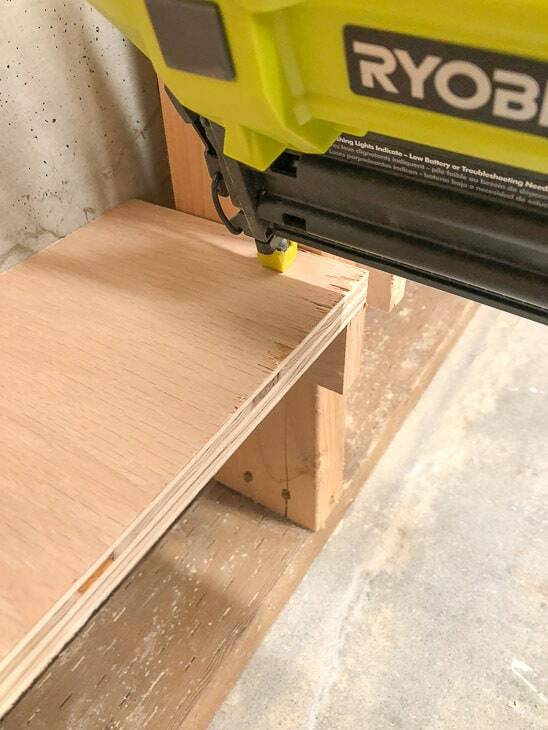 Cut your shelves to the dimensions you measured earlier, minus a tiny bit so they can slide in between the studs easily. Mine varied from 14 1/4″ to 14 3/4″ wide, depending on which section of studs they would go in. All my shelves are 5 1/2″ deep. 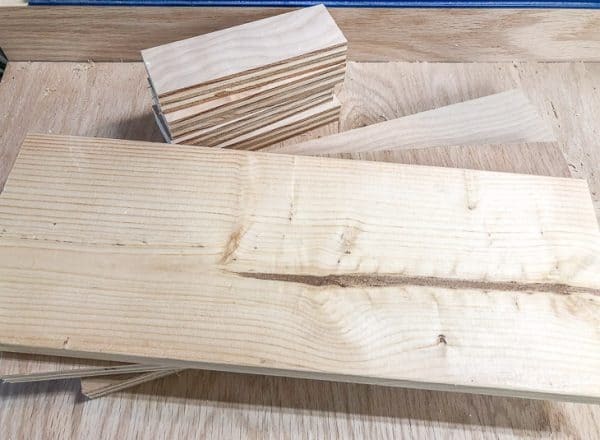 At the same time, cut 5 1/2″ long pieces of scrap plywood or 1 x 2 board for the supports. I just eyeballed the width, using the end cuts from the shelves. Decide on the spacing of your shelves before you start installing them. Mine are 8″ apart, leaving extra space at the top shelf for taller items. 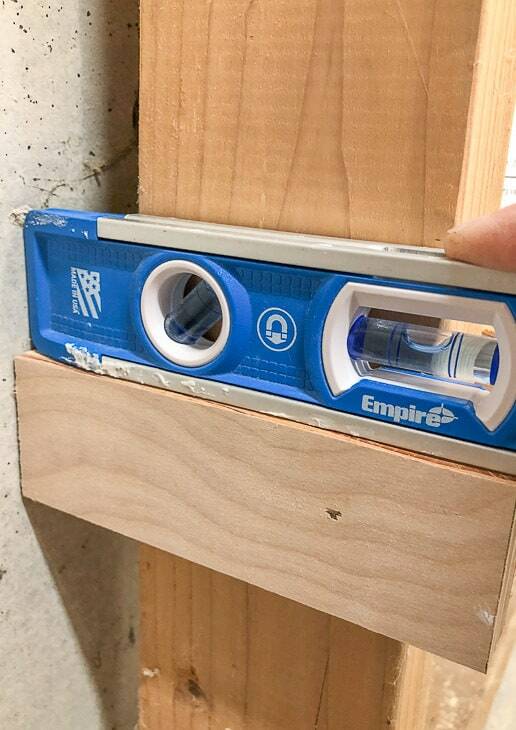 Measuring from the bottom, mark the spot for your first shelf. 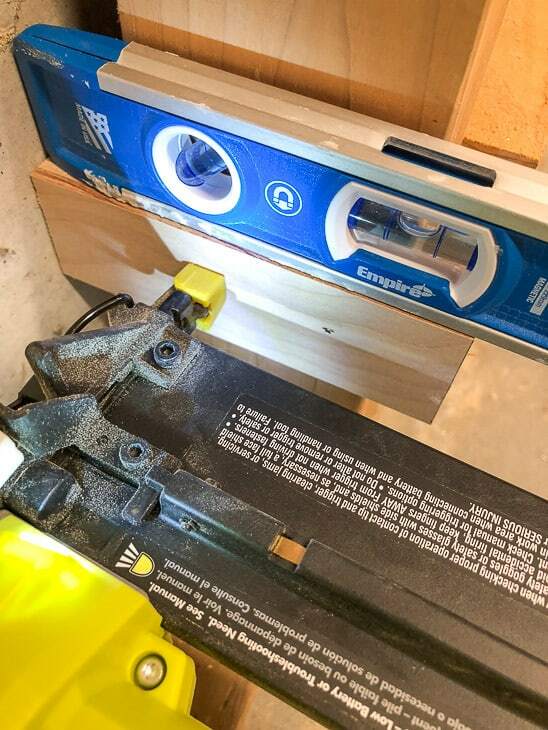 Line up the top edge of the shelf support bracket with that mark, and attach it to the stud with just one nail. The support bracket should be able to pivot slightly on the nail. Place a small level on top of the bracket, and adjust it until it’s perfectly horizontal. Then add more nails to hold the bracket in place. This is where the nail gun comes in handy, because you can use it with one hand while you keep the bracket steady with the other! Repeat for the other shelf bracket, making sure the tops of both pieces are parallel. Finally, slide the shelf in place on top of the brackets. If it’s a snug fit, tap it into place with a hammer. I nailed the shelves to the brackets for extra security, but if they’re a tight fit, they should be fine. These shelves definitely aren’t pretty, but they get the job done! I excitedly started grabbing random stuff to load them up after I got a few shelves done. 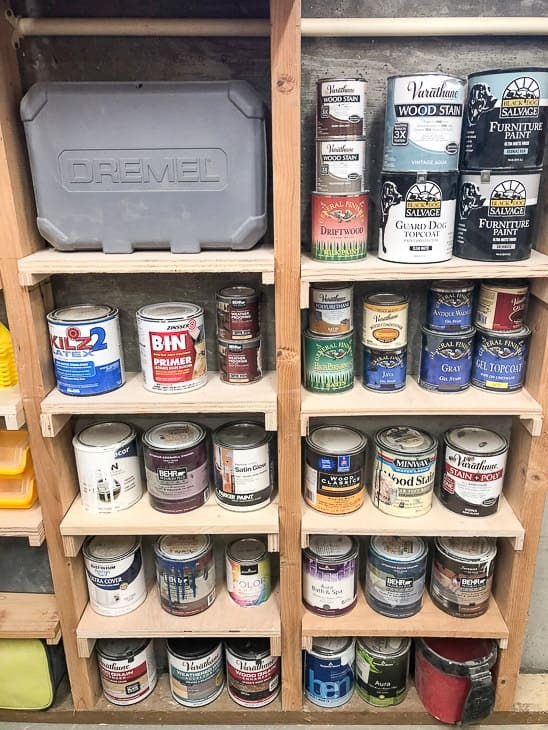 All my quart sized paint and stain cans fit perfectly with room for more (most of the pint sized samples are stored in a wooden box with custom box dividers). My Dremel case finally has a home, after being shuffled from place to place around the workshop. Table saw push sticks and the life-changing Grr-ripper are within arm’s reach of the table saw. I was truly surprised by how much I could fit on these small shelves. Why didn’t I build these sooner?!? Want to build even more storage? Try these easy storage shelves! You can find the free woodworking plans here. Way to work with what you have! 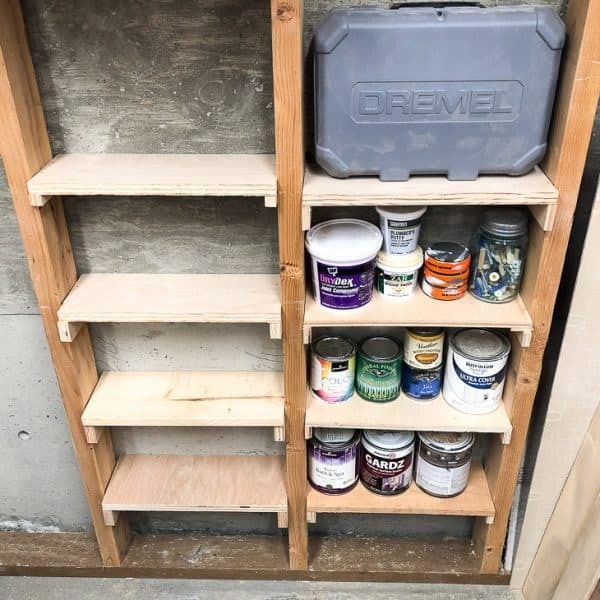 And a great way to store all those small containers of stain and sealer without taking up value shelf space on a traditional shelving unit. That’s a good question! 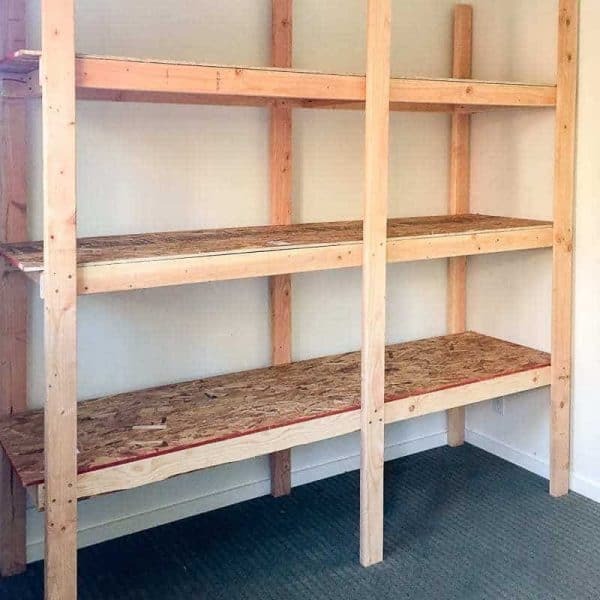 You could try putting foam insulation sheets between the studs, then attaching the shelves in front of that. Adding 2×2’s to the front of the studs like you suggested would keep the shelves deep enough to store plenty of stuff. If you have exposed studs on an interior wall, I would put paints and stains on that wall. Very informative..if I could turn back time instead of being a Hairdresser and a Tour Bus owner, i would be a carpenter..love using my wits as well as my hands. Thanks.